For those of you who don't know I write comedy along with writing about food and I have to say that this sketch (by Portlandia on IFC) is the perfect storm of both of these subjects. Hysterical! A friend of mine does a produce box through Abundant Harvest Organics and if she ends up with something that is not a favorite of her family's (she's got two kids under 3) I luckily get the spoils. 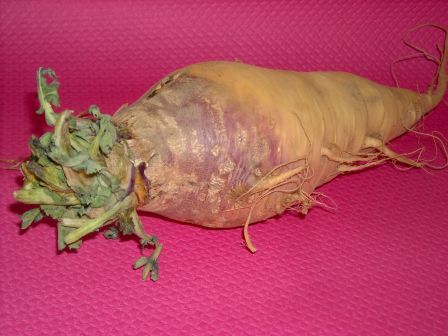 Last week it was a bunch of great root vegetables and after roasting them in my cast iron pan and discovering how tasty the produce really was I felt it was my duty to give this company a shout out. Because on top of it being super fresh and tasty all of their food is also organic (Hey ya!). Abundant Harvest Organics delivers 100% certified USDA organic produce boxes at the price of conventionally grown food. The organization is an alliance of small family farmers in Central California dedicated to growing superior organic produce and getting it to you in the simplest manner possible. And always without the use of chemicals or packaging materials. And they never ever substitute -everything is always organic! Abundant Harvest Organics offers a large box of produce (feeds approximately four people weekly) or a smaller box (feeds approximately two people weekly) plus a growing list of farm-fresh add-ons to choose from such as raw milk, eggs, nuts, grains, meat and poultry—at wholesale prices. As with all CSA's you don't get to specify what's in your box, but what some people look upon as a con I see as an edible adventure. Plus along with saving you from the weekly drain of both time and gas spent going to the supermarket (and the fact that the produce is soooo much more fresh and tasty) the price is positively right. If you are ever unhappy with the quality of an item, you can notify them within 72 hours of your delivery and they'll send a replacement in your next delivery. So if you're looking for a great way to stay on track with your New Year's resolution to eat healthy and you don't love spending hours at the Farmer's markets (which I have to admit I'm guilty of) check out Abundant Harvest Organics. It's Yummm with 3 Ms! Varietal. There was a time when I didn’t know what that word meant. There was a time when I didn’t understand that there was more than one option when it came to fruit. There was also a time when I didn’t like Avocados (positively love them now). People change, usually when they get an education. So here’s one on Avocados and one particular varietal (SPOILER ALERT it’s not the ubiquitous Hass). As previously mentioned Avocados are not a vegetable, but a fruit (it’s actually a member of the berry family). Some 95% of United States Avocado production is located in California (with 60% occurring in San Diego County). Avocados got their name from the Spanish explorers. They couldn't pronounce the Aztec word for the fruit, know as Ahuácatl. Ahuácatl actually means testicle (called such because of the shape of the fruit). Over the years the Avocado has also been known as the Alligator Pear (due to its shape, coloring, and rough skin). Although Avocados contains loads of fat most of it is monosaturated fat (the good kind). They’re also chocked full of Vitamin E (which is awesome! for your skin!). And in case you wondering the varietal I’ve recently gotten acquainted with is the Fuerte Avocado. 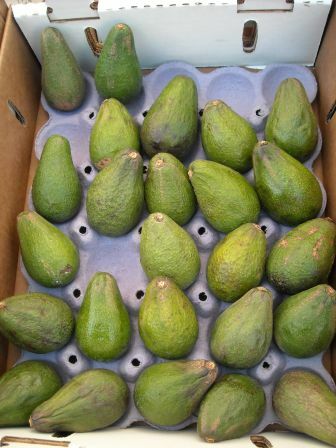 A Spring Avocado, Fuerte has a medium rich nutty flavor with sweet overtones. Fuerte was the first Avocado in California (they showed up in the middle of the 1800s but didn’t become popular till the 1920s). It earned its name (which means Strong in Spanish) after it withstood a severe frost in California in 1913. They’re great in salads and on top of Mexican food. Here in the US we mainly use Avocados in the form of Guacamole, but in other parts of the world such as Brazil, India, and the Philippines Avocados are used to make milkshakes. To hurry ripening put them in a paper bag with a banana. If your Avocado is too ripe you can refrigerate your Avocado for several days. Avocado becomes bitter when cooked, so make sure to enjoy them raw. When adding Avocado to cooked dishes, do it at the last minute after its come off the heat. Food and Travel (absolutely two of my favorite things!) and if you're looking for knowledge on both of them then maybe you might want to check out the 7th Annual Los Angeles Travel & Adventure Show (I will be!). The largest travel show in the West, will take place this weekend on January 14th and 15th, 2012 at the Long Beach Convention Center and feature talks from beloved Travel Channel personalities Samantha Brown and Andrew Zimmer, valuable insider tips from industry experts, hands-on activities, cultural performances, and access to domestic and international exhibitors offering show-only specials. The five-acre show floor will be chocked full of exhibitors providing expert advice on visiting destinations as near as Palm Springs and as far as Taiwan. Tour operators and travel experts representing locations around the globe, various modes of transportation and recreation, and related products and services will be on hand all weekend, offering information and show specials for consumers. Popular destinations that will be featured at the show include Germany, Tanzania, Indonesia, Maui, Costa Rica and more. The new Culinary Stage will showcase culinary experiences through unique cuisine from different destinations around the globe. Two events that I'll be checking out on Sunday are Farm to Table – Luscious Lemon and Avocado Taste Sensations from 120 Year Old, Sustainable Limoneira Ranch (@ 1:00) and Travel for Foodies – Tips, Trends, and Tools for the Culinary Traveler (@2:30). The Los Angeles Travel & Adventure Show will take place at the Long Beach Convention Center Saturday, January 14th and Sunday, January 15th, 2012, 10:00 a.m. to 5:00 p.m. Tickets are $10 at the door or $7 online in advance with Promo Code: LAPR; children age 16 and below admitted free with paid adult. Ticket purchase information, a current schedule of speakers and more details are available at www.latravelshow.com. Romanesco Cauliflower, pretty and mathmatical! It's the time of year for Romanesco Cauliflower at the Farmer's Market! They are such a work of art to look at, so pretty. Their shape is (approximately) a natural fractal (a rough or fragmented geometric shape that can be split into parts, each of which is a reduced-size copy of the whole). Which in a nutshell means that the big part (the whole head of Cauliflower) is composed of smaller parts (each bud) is composed of a series of smaller parts (more buds) that all favor the same shape. 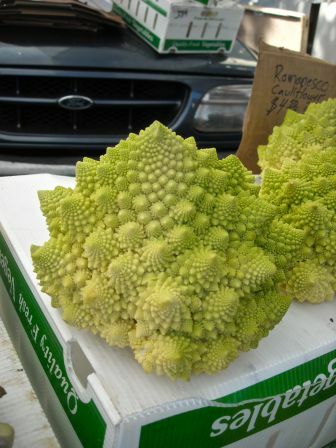 The number of spirals on the head of Romanesco broccoli is a Fibonacci number (which in case you don't remember from high school math is an integer sequence: 0, 1, 1, 2, 3, 5, 8, 13, 21, 34... where each subsequent number is the sum of the previous two). Or you can just say they are such a work of art to look at, so pretty! If your New Year’s resolutions for this year included learning about Santa Barbara wine (which is a great great resolution!) then look no further than the Learn About Wine‘s "9th Annual STARS of Santa Barbara Wine.” Without actually driving to Santa Barbara, you’ll have the pleasure of tasting over 100 established and up-and-coming wines of the region, while learning about them from the owners, winemakers and winery executives themselves. As someone who checked out Santa Barbara and the wineries a couple of months ago I will say that this list is really Ch-oice! : Alma Rosa Winery & Vineyards, Bien Nacido, Bonaccorsi Wine Company, Brewer-Clifton, Brophy Clark Cellars, Buttonwood, Byron, Cambria, Coquelicot Estate Vineyard, D'Alfonso-Curran Wines, Dragonette Cellars, Fontes & Phillips Wines, Foxen, Gioia, La Fenetre, Liquid Farms, Martian Ranch & Vineyard, Palmina, Reeves Ranch Vineyard, Riverbench, Silver Wines, Tercero Wines, Thorne Wine, William James Cellars, Zaca Mesa and they’re still adding more. 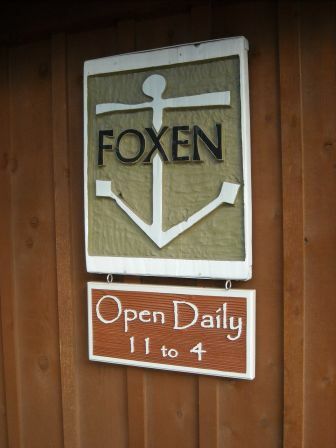 I have to say one of my absolute favorite’s (Foxen, hence the pict) is on that list and in my opinion the event is totally worth it just to sip they’re Chards and Chenin Blancs (which I did in November at their tasting room in the Santa Maria Valley during the day and then again at illustrious Seagrass Restaurant in Santa Barbara that night). I’ve been to a couple of events hosted by Learn About Wine’s founder Ian Blackburn and he’s awesome about teaching you about wine in a way that doesn’t overwhelm you or make you feel like an idiot (which a lot of wine people do and can be such a turn off!). The last Learn About Wine event I attended opened my eyes to French varietals like a kid who gets the 128 box of Crayola crayons after working with the 4 pack for a year straight. The discounted rate of $139 it isn’t cheap, but truthfully you get what you pay for, which is why the good stuff (like the stuff that comes from Santa Barabara) never is! So if you’re in need of a Santa Barbara wine education look now further than the STARS of Santa Barbara! To buy tix click HERE.